If you were to look up the UK’s most senior police chief and the home secretary on the Police National Database you should not be surprised to score a hit. Because their recent speeches on police ICT were well suspect. They were also completely at odds with what Cabinet Office experts say is the way to reform public sector IT. While the Cabinet Office claims to be trying to “put an end to the oligopoly of large suppliers that monopolise its ICT provision,” the Home Office and ACPO are preparing plans that will give the oligopoly more billions and more power to call the shots by privatising the National Policing Improvement Agency (NPIA), the quango that manages police ICT. If its not a case that the right arm doesn’t know what the left arm is doing, has the Cabinet Office has been telling porkies or is the police service being sold a pup? Home secretary Theresa May told last week’s summer conference of police chiefs that police ICT was a costly mess, so it should be centralised and privatised. The Cabinet Office says public sector ICT is a costly mess, so it should be distributed and its public management strengthened at the centre. The Cabinet Office angle is that public sector ICT went to pot in the last 20 years because the government stopped being an “intelligent customer”. And why did it do this? Because in the late 80s it closed the Central Computer and Telecommunications Agency (CCTA), the government equivalent of the NPIA, forcing departments to rely on more on Boo Hissstems Integrators. Needless to say they had their own shareholders, not the public at heart and public sector IT became the costly mess it is now. Even on the face of it, May’s story lacks credibility. The NPIA she wants to privatise has already consolidated half of all police ICT contracts. It could be told to get on with the rest if the aim of May’s reforms is consolidation, as she claims. The problems May says beset police ICT reside among those contracts not yet managed by the NPIA but by individual forces. Yet she told police chiefs the NPIA was at fault for this mess and justified its privatisation. As the home secretary told police chiefs that a “commercial” NPIA would be “more efficient”, the Southern Cross OAP empire was collapsing on foundations made of neglected pensioners and desperate staff, demonstrating what private sector efficiency really means for public service. This is no minor concern when one thinks of ICT assets for which NPIA is responsible, which includes all those things that raised fears of the modern police service becoming a hi-tech Stasi, such as the national intelligence, DNA, fingerprint and number plate databases. Run for profit, assets like these will make surveillance campaigners fears of “function creep” in state snooping seem somewhat understated. A public NPIA might do more than defend the public purse from profiteering suppliers. One plan mulled by the privateers is giving these assets to the Metropolitan Police Service (MPS). The police tech “GovCo” would only be allowed to keep anything it builds anew. This is likely to be motivated more by the concerns of potential capital investors than privacy. Sir Hugh Orde, chief chief at the Association of Police Chiefs (ACPO), made it a financial issue when he took to the conference podium after the home secretary last week. He gave a few backhanded complements to the NPIA before claiming it had landed forces with an “unexpected” charge of £5.2m for running the Police National Database. Yet Orde and other police chiefs knew full well about the charges because they set them in conjunction with the Home Office as members of the NPIA board. Orde nevertheless warned rising police ICT costs had become such a “significant risks to the service” they would force forces to axe Bobbies. Woe betide anything that threatens the livelihoods of our beloved Bobbies. Orde turned the NPIA into a threat to the police and declared for a radical solution – “a reality check”. And what was this radical solution? He didn’t say. But May had already told us: privatise the bastards quick, before they bring the service down. For a real dose of reality, consider whether a profiteering police agency will charge forces any less for its services than the NPIA already does. And remember the mooted plan involves giving existing databases to the MPS, which will still want forces to pay their bit for their running costs. You won’t get any more reality than that because the advice on which May is acting remains unpublished. It comes from her special advisor Lord Wasserman, who was due to publish his report on the “Future of Police IT” last December. Orde knows about it already. All the public knows so far is what he and May said last week. Wasserman’s advice has been to give private companies a greater say and local forces less, which does not bode well for the Future of Police ICT. The interests of those private companies, like Capgemini, Logica and Northrop Grumman, run contrary to the cause of more efficient and cost effective government IT, as the Cabinet Office has been saying. May unwittingly clarified this when she gave her reasons for the further consolidation of police ICT. Suppliers were spending in excess of £1m a-time bidding for work at each of the 43 local police forces when they could save money by bidding for just one central contract, she said. But the only companies that could afford to bid for contracts at all 43 agencies are those same oligopoly suppliers who the Cabinet Office wants to bring down a peg. 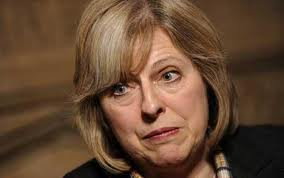 May reckons in other words that police force should restructure their ICT for the convenience of for large suppliers. The government ICT strategy proposes a different solution: Open Source, Open Standards and Software Re-use, a policy that would preserve local autonomy and break the neck-hold the ICT oligopoly has on the public sector. That strategy’s being overlooked – particularly by those privatising police ICT – because it’s not in the interest of large ICT suppliers. Wasserman, May and Orde have yet to present a convincing argument that their unpublished policy acts in any other interest.